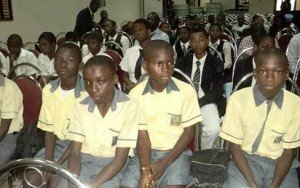 Secretary to the Lagos State Government, Dr. Oluranti Adebule has charged teachers in the state to always put in their best in the discharge of their duties so as to distinguish themselves among their peers. Adebule, who presided over at the merit award ceremony noted that the Annual Education Award is meant to recognize, motivate and appreciate teachers, principals and non-teaching staff who have distinguished themselves in their various discipline. In her welcome address, the Commissioner for Education, Mrs. Olayinka Oladunjoye, commended teachers in the state for giving their best to their students, stressing that they would always earn her respect and admiration since they have chosen to be dedicated and remarkable heroes. Thanking the awardees and other staff, Oladunjoye admonished the teachers to bequeath lasting legacy to the children by striving for a 100% performance in the WAEC examination, adding that the practice of rewarding hard work and dedication of staff of the education sector has come to stay. She opined that the objective of the annual education award is to inculcate and encourage positive attitude to work as well as promote excellence by motivating and celebrating awardees and stakeholders in the sector. Other awardees include Mr. Abiodun Aiyerin of Vetland Senior Grammar School, Ifako Ijaiye as Best Principal in the Senior Secondary School category, Mr. Emmanuel Adebiyi of Iju Junior Grammar School, Iju as the Best Principal in the Junior Secondary School category and Mr. A. O. Ambali of St Georges Nursery and Primary School, Falomo as the best Head Teacher.